The FL9000-AC Series flowmeters are ideal for a wide range of flow monitoring applications. These low cost flow meters will install in any position easily. 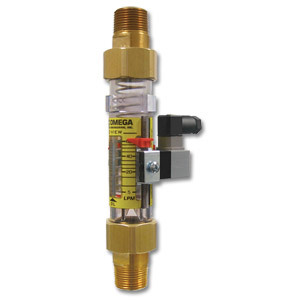 Additional features include an adjustable flow alarm externally mounted on the flow meter. The flow alarm will automatically open or close AC electrical circuits, activating warning lights, bells, pumps or other process control equipment. *Fits 3/4" Nominal (7/8" OD) and 1" Nominal (1-1/8" OD) type M copper tubing. **Do not use pipe dope when mounting, use PTFE tape only. 1 MNPT Polysulfone . Water (Std Piston) **Do Not Use Pipe Dope When Mounting; Use PTFE Tape Only. 1 MNPT Polysulfone. Oil (Std Piston) **Do Not Use Pipe Dope When Mounting; Use PTFE Tape Only. For models with a DC rated relay, replace suffix "-AC" with suffix "-DC", no additional cost.